An agreement has been reached to allow aid to be flown into the South Kordofan and Blue Nile regions of Sudan, where hundreds of thousands of people are critically short of food. The UN, African Union and Arab League signed the deal with SPLM North rebels. But one senior rebel leader, Yassir Arman, told the BBC that the flights required Sudanese government approval. Mr Arman said permission for aid to the two areas had been blocked by Khartoum for nearly a year. The agreement was signed in the Ethiopian capital, Addis Ababa late on Saturday. It calls for the immediate establishment of an assessment team to produce a report on conditions in Blue Nile, and in the Nuba Mountain region of South Kordofan within two weeks. The SPLM North has agreed to an immediate cessation of hostilities to enable the assessment to take place and for the aid flights to get under way. Mr Arman said that between 300,000 and 400,000 people were in urgent need of aid. But he told the BBC: "A cross-border operation from Ethiopia and South Sudan would have been more effective than this operation. "This agreement puts the issue of access and sending assistance in the hands of Khartoum, and this is the main weakness of this agreement." The BBC was unable to reach the Sudanese delegation in Ethiopia for comment. 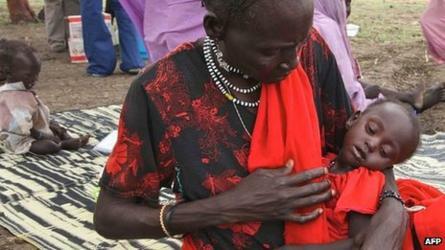 Tens of thousands of Sudanese have fled across the border into South Sudan to escape hunger and fighting. Mortality rates in one refugee camp in South Sudan, Jamam, are nearly double the threshold for an emergency, the aid group Medecins Sans Frontieres has warned. This means that about eight children are dying every day in the camp, which houses about 40,000 of the 120,000 people that have fled the conflict in Blue Nile state. The medical charity said people were dying of preventable diseases because of "horrific living conditions". Latrines have overflowed, contaminating water sources, because of heavy rains. South Sudan seceded from Sudan a year ago - as part of a deal to end years of civil war.